A lawsuit is a civil action brought before a court of law in which a plaintiff, a party who claims to have been damaged by a defendant’s actions, seeks a legal remedy. A lawyer who specializes in civil litigation is known as a “litigator” or “trial lawyer.” Lawyers who practice civil litigation represent parties in trials, hearings, arbitrations and mediations. In a civil lawsuit, the plaintiff (the injured party) files a complaint, which describes the legal and factual basis for the action. The defendant is required to respond to the plaintiff’s complaint. In many cases, the trial lawyers are able to settle the case before it goes to court. If the plaintiff is successful in court, a court order may be issued to enforce a right, award damages, or impose an injunction to prevent an act or compel an act. A lawsuit may involve disputes between individuals, business entities or non-profit organizations, and, in some cases, the state to be treated as if it were a private party in a civil case. Though the majority of lawsuits are settled and never even get to trial, they can expand into a very complicated process. 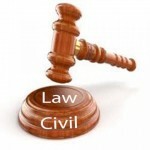 A civil litigation lawsuit is started as soon as the plaintiff files a written complaint. The defendant must then respond and deliver a written “answer” to the complaint in order to make any kind of plea. After the answer is filed, the parties engage in the “discovery” process. At this point the parties will learn about all the facts involved in the case in order to prepare the trial. The discovery process includes witness questioning and answering, the exchange of documents, as well as written questions, known as “interrogations.